Before I begin writing this, let me tell you – I’m not a professional chef. Everything written here is coming from my experience cooking at home. I’ve been cooking pasta for five years now and technique has progressively gotten better; to the point that I can whip up a pasta dish in less than 20 minutes. The key is to practice and have a keen sense of taste. Ever since I started posting pictures of my pasta lunch/ dinner on Instagram, people have asked me various questions such as how long do I cook it for, do I add oil, what sauce was used. I have made a note of those queries and here I am, answering all of them. My standard measurement is 2 handfuls of dried pasta for one person. Penne, farfalle, macaroni, fusilli and such types of pasta can be measured this way. For noodle shaped pasta (spaghetti, angel hair) follow the OK/ ten rupees coin rule – make a circle the size of a ten rupee coin with your thumb and forefinger, that’s how much per person needs. It also happens to be an OK sign. OK? Of course, boiling pasta is the way to cook it first. I always use a big pot of water and bring it to a boil. Add at least 2 tsp of salt to the water when it starts boiling. 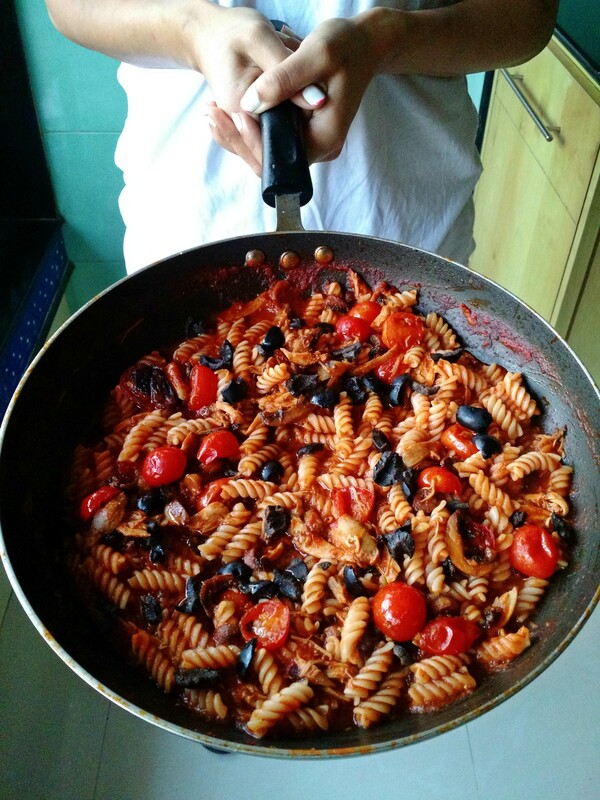 It adds some flavour to the pasta – trust me on this. Pasta should be eaten al dente (with a little bite to it). Most restaurants serve fully cooked pasta which makes it mushy and easily breaks. Next time you eat at a restaurant and your pasta appears broken, it is overcooked. I always set the timer to 8 minutes (Barilla brand of pasta takes 10 minutes to cook) and add pasta to the boiling water. A good stir helps things get started in the pot. Many people close the pot with a lid, but I’ve never needed to do so. At 7 minutes 30 second mark, reserve a cup of pasta water and drain the pasta. This drained pasta must be immediately added to the sauce. In case your sauce isn’t ready, just add a tbsp of olive oil or butter to the pasta, toss it and keep aside. Do not, and I repeat do not wash it in cold water to stop the cooking process. It just gets sticky. You could also use the reserved pasta water to ‘revive’ pasta which has been sitting for a while. Why do I save pasta water? The starchy water slightly thickens the sauce and helps it stick to your pasta. For fresh pasta, 4 to 5 minutes of cooking time is enough. This is an endless debate. I almost got into an argument when I asked a chef at a five-star hotel this question and he insisted on adding oil. “If you don’t add oil, your pasta will stick,” said the expert. I used to add oil because everyone says you must. I stopped adding it about four years ago and I’ve never had a problem. If you add enough water, the pasta will freely move around and cook evenly. So add enough water instead of adding oil, please. The sauce can be anything from a 2-hour simmered tomato sauce to a 5-minute “sauce” made with butter, garlic and mushroom. My sauce is usually ready before the pasta. Just as it hits the pre-al dente stage, I drain my pasta and add it to my sauce. To give you a scenario, I set my pot of water to boil on the stove, start chopping my veggies. The water is just about to start boiling and I start cooking my vegetables (usually onions and garlic). When the water is boiling, set the timer to 8 minutes, I add salt and pasta, stir it around. Then I focus on my sauce. At 7 minute mark, I’m done with my sauce so I bring down to heat and gently simmer it. At 7 minutes 30 second, I add my drained pasta and some of the water. Cook for no more than 20 seconds on full whack and that’s it. It’s ready to serve. You don’t have to add cream or a load of tomatoes to make a sauce. A fresh pesto; clams cooked in white wine; vodka flambéed prawns with onions; mushrooms tossed in sage butter and pepper; cherry tomatoes with garlic – all qualify as a pasta sauce. The sauce is the flavour you give your pasta so experiment! I’ve mentioned a few sauces that I make at home. Cook garlic and some onions till soft. Add peeled, chopped tomatoes and cook it down. Mash the tomatoes with the back of your spoon for a chunky sauce or blend it with a hand blender. Balance the flavours – salt, sugar (if needed) and pepper. Cook garlic, little chopped green chillies, and onions in olive oil. Add chopped tomatoes, salt and vodka. Carefully flambé it. Finish off with chopped parsley. Melt butter with a drop of olive oil. Add torn sage leaves and fry till crisp. Add mushrooms and a dash of Tabasco. Cook till done. Cook garlic and mushrooms till done. Add finely chopped coriander, Tabasco and a splash of milk. Add some butter to make a light sauce. Add cooked pasta immediately and toss well. Grind basil, garlic, salt, pine nuts or walnuts, grated Parmesan and olive oil. Adjust flavours. Add this to cooked pasta and mix well. Follow the same recipe as Fresh Pesto. Just replace basil with sundried tomatoes. Cook half cut cherry tomatoes in olive oil and garlic with torn up basil leaves. The best pasta you eat will be the one fresh off the stove. Letting pasta sit just ruins the fresh flavors you’ve added. With practice, I’ve managed to learn how much time it takes to cook and if the person I’m cooking for will be ready to eat by the time I’m done. You’ll learn this too. Garnish the pasta with some parmesan, fresh herbs, or extra virgin olive oil. I don’t need garlic bread but some people I know do. Sometimes I don’t have garlic bread handy so I just toast plain bread and rub a clove of raw garlic on the bread. Finish with some butter and that’s it. I hope this answers some of your questions about cooking pasta at home. I’ll keep updating this post if I learn something else that will help you make pasta easily at home.